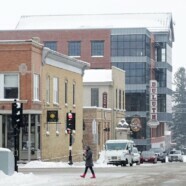 Mount Horeb adds new corporate jobs, restaurants and retail | Vandewalle & Associates, Inc.
MOUNT HOREB, WI (EXCERPTS FROM MADISON.COM): The City of Mount Horeb has been undergoing a period of growth, particularly in the downtown–bringing new retail, restaurants and residents. The latest big change comes from a new four-story, 108,000-square-foot corporate headquarters building a block off Main Street for Duluth Holdings, the parent company of Duluth Trading Co. Meanwhile Gempler’s, a direct catalog and web retailer that sells clothing, tools and other equipment to agricultural producers and homeowners who like to work outside, has also returned to the village. This is where it was founded in 1985 by Steve Schlecht, who went on to buy Duluth Trading Co. after moving Gempler’s to Belleville more than 20 years ago. In the last six years, the village’s east side has seen the construction of a Miller & Sons grocery store, a 61-room GrandStay Hotel & Suites, a 2,000-square-foot production facility for Sjolinds Chocolate and a major expansion of Little Vikings Daycare. The more recent additions to the downtown include the Hoff Apartments, Trail This Bicycle Shop, The Pop Place, which sells craft soda by the bottle, and the $1.8 million Driftless Historium, a museum and cultural center that opened in 2017, thanks to major backing by Schlecht. Last week saw the opening of Icky Sticky, a business on Main Street that sells ice cream, Hawaiian shaved ice and baked goods. Brix Cider, a craft cider manufacturer that uses apples from 18 Wisconsin orchards, opened on Thursday in a Schlecht-owned building next to Duluth and includes a tasting room and farm-to-table dishes.